I am completely in love with this sock. Although it took me the better part of a week to finish those final bits that should have taken an evening or two, I'm happy to tell you that my Mad May sweater is complete! This pattern was one of two main reasons I bought the book, and when I was forced to take home six skeins of this gorgeous green tosh from my LYS (seriously, the yarn wouldn't let me leave without it! ), I knew it would be a perfect match with this sweater. The body and sleeves really flew, despite the fact that I was alternating skeins every two rows/rounds to avoid any unseemly pooling. It can be a bit of a pain and can make the project a little less portable, but I think it's worth it. The only place I didn't alternate was for the button bands, and that was frankly because I was being lazy and didn't want to add time to the project by having more ends to weave in. The real star of this sweater is the gorgeously cabled yoke. Some of these rows took a half hour or more to do, but they were worth it. Aren't these leaves just incredible? My only real modification to this sweater was to knit a size smaller than I normally would. For one thing, I didn't have enough yarn to knit the bigger size. But it turns out to have been a good thing, because my gauge was a little off. I think Alana Dakos is a very tight knitter; she gives a gauge of 24 stitches and 30 rows using a size 5, but I was only able to get 22 stitches and 32 rows over four inches -- and that was with a size 4. I saw her post somewhere on Ravelry that the dense gauge was somewhat deliberate (it would really make the cables pop), but I liked the fabric I was getting on 4's and just couldn't see going down to a US 3 for a DK sweater. Thanks to the difference in gauge, I was able to knit a smaller size and have it come out just right to fit me, as you can see. I really couldn't be more thrilled with how this turned out. The pattern was very well written, and clearly the finished sweater fits me well. Mother Nature was even obliging enough to send us a cold front that made it cool enough on Saturday to actually need a sweater, so I was able to show it off around town. My only disappointment is that these shots do not do it justice; my camera did not seem to want to capture the beauty that is this colorway accurately, and though I color-corrected the photos you see above, they're still not quite accurate. I suppose if that's my only complaint, then I have a real success on my hands. I'm happy to report that my sweater is done (you'll get to see it in another day or two), so I've been able to spin again without feeling guilty. On Friday night, I finished spinning the fourth and final bobbin of singles for my cabled yarn. 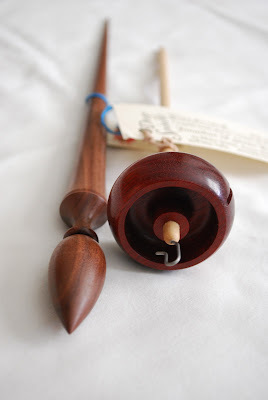 Yesterday, I started plying up the first of two bobbins. After I ply all the singles, I'll then ply the two-ply yarns together. 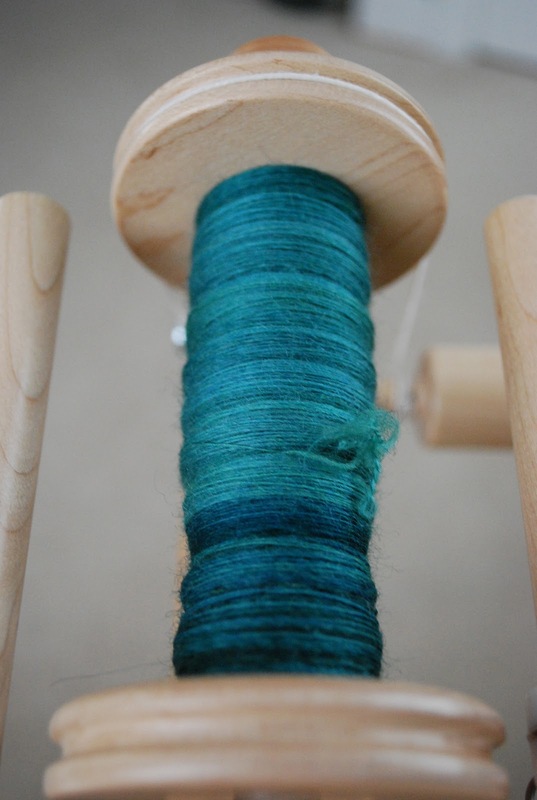 Based upon a quick ply-back test on this bobbin's yarn, it looks like my finished yarn should be sport weight-ish. Also, though it's not spinning, I have some spinning-related knitting to share today. I finished my socks with the regular and opposing three ply! I decided to keep these very simple, because in my experience, the true beauty of handspun socks is the yarn. I really wanted to let it shine (and stripe, apparently), so I stuck to some plain-vanilla stockinette with a couple of interesting features. For one thing, I added some cable twists to the cuff of the opposing ply sock so that I could tell them apart down the road when I'm evaluating their relative durability. I also changed up my typical heel to get some more wear in that area because that seems to be where I develop holes first. Rather than knitting back and forth over half the stitches for a heel flap, I worked in the round while I increased next to the instep stitches every other round to create the gusset at the same time. Then I turned the heel as usual and proceeded to work back and forth over the resulting sole stitches (maintaining the slip-stitch patterning) and working decreases at each end to connect those stitches to the gusset stitches until I had the right number of sole stitches left. 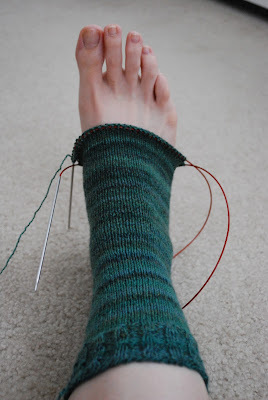 The result is a heel that looks very much like a flat-and-gusset sock but that will (I hope) be a little more durable. Supposedly the yarn spun with an opposing ply will be more durable in the long term, so the point of these socks is to test that theory. I'll be wearing these normally through the fall and winter and will report back if any holes form. Last night I was once again thwarted in my attempts to finish my sweater by a nonsleeping toddler, but I can say with all certainty that it will be finished tonight. I managed to squeeze in some time on it this morning while I finished my tea and now have just half a row to finish binding off. Once the binding off is finished, all that's left to do is weave in three ends and sew on six buttons. I predict that it will take me no more than about 45 minutes, which means there should still be time to pop it in the tub to block tonight. Hooray! I am so close to a finished sweater I can taste it. The Mister is traveling for work for a couple of days, so my knitting time in the evening is determined strictly by when Rainbow falls asleep (because most nights I have to sit with her until she does). On Sunday, she passed out at 8 on the dot, which was perfect because it allowed me to see the Call the Midwife finale in real time and get in a solid two hours of knitting. Last night, however, she tossed and turned until 9, which meant I didn't make as much progress as I'd hoped. Still, I'm in a good place. I bound off the neckline, grafted the underarms, and wove in all the ends except for the one from the neck (which I'll bury in the button band on that side). Before shoving it in its project bag for the night, I tried it on, and it looks like it'll fit perfectly once it's blocked. Given that my gauge was off and I knit a smaller size to compensate, that's a big relief. Tonight, the mission is to finish at least one button band. If she cooperates and goes to sleep earlier than last night, I might even get started on the second. If all goes well, I could have a finished sweater by tomorrow night, which would be just fabulous. I'm also making some steady progress on my socks. I finished the heel turn and short-row section at lunch yesterday and am cruising down through the foot. I'm anxious to get this one done not because I want to wear it (it feels like the middle of July here right now!) but because I have a sock design idea percolating and I want to get to swatching. And it goes without saying that I'd like to knit something in a color that isn't green for a change! I've been very diligent about working on my Mad May Sweater, but now that the end is in sight (I should finish this week), I thought it was permissible to take some time to do a little spinning. I've been staring longingly at my wheel for much of the week, so it was a real treat to get back to it. My in-laws came over earlier this afternoon to see Rainbow and took her to the playground for a while, so I was able to finish up the third bobbin of singles for my cabled yarn. Although I'm still enjoying the experience of spinning this fiber (Crown Mountain Farms Corriedale pencil roving), I'm really ready for a new color. Once I finish up the fourth bobbin of this, I'll have spun 8 ounces of this colorway -- and I suppose it doesn't help that the socks I'm knitting are out of the yarn spun from the first half of the fiber. Because I don't have a whole lot of spinning to share with you today, I thought I'd share my most recent stash acquisitions. I think I mentioned last week that I signed up for the Through the Loops mystery shawl, so my task when I was at my LYS yesterday was to find appropriate yarn. I needed sport weight in three colors, and I knew I wanted a solid or a nearly solid. I finally settled on this Louet Gems. I picked (in order, from left to right) Caribbean Blue, Pewter, and Linen Gray. These are colors I wear on a regular basis, so the finished shawl should coordinate well with my wardrobe. This is Done Roving Yarns' Frolicking Feet in the colorway Cloverleaf. This 100% superwash merino is new to my LYS. I managed to resist it for several weeks but couldn't turn away from its siren song any longer. I'll be using this for a lace shawlette -- hopefully the one I started designing in my Kirsten Kapur class from about a month ago. The week ahead looks to be even crazier than the last, but I am pushing on with my sweater as I must finish it before the end of the month. Keep your fingers crossed that I pick up some speed and have a finished item to show you before this time next week! I had thought that once I got the sleeves and body of my Mad May sweater joined together it would go a lot faster, but it appears I was kidding myself. When you have rows that are nearly 300 stitches long, they take a while. I have been working on the yoke all week (I joined the pieces on Monday night) and now have the rest of the current row and one wrong side row to do before I can actually start the cable pattern. My sock is moving somewhat slowly as well, as I've only been working on it for about 40 minutes each day during my lunch break. I finished the cuff -- with some mock cable twists in it so I can tell it apart from the other sock -- earlier in the week and have been doing nothing but plain stockinette since. I'm finding the fabric in this sock to be curiously lighter than the other, and I'm wondering if it's because of the opposing ply in the yarn or if I just happened to get the lighter spots in the fiber more in this section of yarn. The striping pattern that happened in the first sock is happening in this one, too, but it's a lot more subtle. On top of all this, I've really been itching to sit at my wheel and get the rest of my singles done for my cabled yarn, but I've been focusing too much on my sweater. Perhaps I will sneak in some time this weekend -- after the craziness of last weekend and the running around I've been doing this week, I really need that meditative time. I know it may seem like I've fallen off the face of the earth, but let me assure you I have not. I've just been insanely busy, and life has kept me away from my knitting, my spinning, and my blog. My brother (I nearly typed "baby brother," but I don't think I can call him that anymore) graduated from law school on Friday. Several relatives came in from out of town for the event, including an aunt and uncle who I haven't seen in about two and a half years, so much of our time this weekend was spent with family. We had a big family dinner on Friday night that kept us all up late -- and that meant Rainbow was up super early on Saturday morning (for some reason, if she goes to bed late, she gets up early). After a family brunch, she lost her cool and actually took a nap, which gave me just enough time to run to Target for some needed stuff and get back just as her new bedroom furniture was being delivered. By the time we got her bed made and had transferred her needed items to the new room, it was time to get her dinner. Then her babysitter arrived and we left for another family dinner, from which we didn't return until after 10. Then, yesterday, we had both our families over for a Mother's Day lunch. Between all the visiting and eating (plus the usual cleaning and errands that have to be done over the weekend), I hardly touched my needles and only glanced at my wheel all weekend. I started the second sleeve of my Mad May sweater on Saturday night and got the cuff and about eight rows beyond that done by bedtime. Yesterday afternoon, the Mister very nicely allowed me to have some time to myself, so I was able to catch up on the DVR and get a good portion of sleeve done. By the time I had to put it down for the night, I had only 20 rounds left to do. That means tonight (provided a certain toddler goes to sleep easily), I will be able to start the yoke! I did take my sock bag with me in the car over the weekend, and as a result I was able to finish the first of the pair. This is the one knit from the traditional three ply, and it's a plain vanilla sock with the exception of the heel. I'm not sure what this heel is called (it may be a Cat Bordhi sock architecture), but basically I worked the heel flap and gusset simultaneously while continuing to work in the round and then worked a flap back and forth on the bottom of the heel. I figured that because the socks I've been wearing out have all developed holes in the heel area, a little bit of extra reinforcement is not a bad idea. While I was at it, I cast on for the second sock and did a little bit of the cuff. I'm doing some mock cable twists in the ribbing so that I can easily tell the two socks apart; otherwise, they'll be identical. I had a fair amount of yarn leftover from the first sock, so I'm hopeful that the yardage I have for sock #2 is sufficient. If not, I can always use the leftovers for the toe. I'm hoping that I can have both of these projects done before the end of the month, though things in the next two weeks are likely to be just as busy. I just have to remind myself that knitting is my stress relief, so sometimes I need to do it to keep myself sane! Over the weekend, I came to a realization about my knitting. Though it was unintentional, it seems I have been color-coordinating all my projects. If you recall, the last two things off the needles (my Vitamin D and my Rubus suberectus Socks) were both gray. Now, it seems, everything must be green. 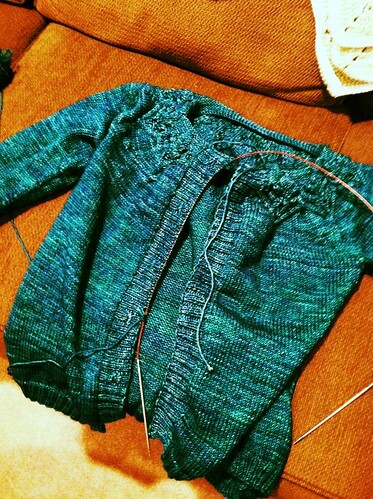 For starters, there's my Mad May sweater -- Alana Dakos's Gnarled Oak Cardigan -- which I'm knitting in tosh DK in Forestry, a deep, glowing green with a hint of blue. I made very good progress on this over the weekend, as I was able to work on it in the car and in the hotel room both Friday and Saturday evening. I finished the body on Monday and started on the first sleeve, which is moving along a little slower than I was expecting (but I guess having two skeins of yarn attached and having to move them around regularly does slow one down). Then, there are the socks, which are being knit out of my own handspun -- also in shades of green. These saw some action over the weekend as well (I took them to the festival to work on while waiting in line or sitting and taking a break). I turned the heel on Saturday evening and now they are well on their way down the foot. I expect I'll have the first sock finished soon. As if that wasn't enough green, there's my spinning. If this looks familiar, it's because I'm spinning up the rest of the fiber that I used for the sock yarn. It's Corriedale pencil roving from Crown Mountain Farms in the colorway Eire. This batch is being spun into a 2x2 cabled yarn; this bobbin is number three of four, each holding about an ounce of fiber. So it seems spring has arrived everywhere, even in my yarn and fiber choices. I wonder what next month's color theme will be! The festival this year was, in a word, fantastic. The weather was absolutely perfect -- sunny, clear skies, low humidity, and even cool enough to wear a shawl and be completely comfortable. We got to the fairgrounds at about 8:25 and headed right to the main exhibition hall, where most of the vendors we wanted to visit were located. The lines were rather unbelievable at some vendors, but throughout the course of the day, we were able to stop at every booth on our list, I think. We went back for just a bit on Sunday morning to stop at a few booths that were much too crowded all day on Saturday before we headed home. But enough about our schedule. You want to see the haul, right? This actually looks to be two strips held together, so I can spin them separately or ply them together as I wish. I was also hoping to get another Into the Whirled batt and got there early enough on Saturday to snag one of the Firefly-themed batts. This is Falkland in a colorway called Captain Tightpants. The colors are a little more vibrant in real life; the sun seems to have washed them out a bit. Usually MDSW for me is about buying fiber, but this year I did have some yarn on my list and was able to find exactly what I wanted. I braved the enormous crowd at Miss Babs for some of her Yowza -- Whatta Skein! in Indigo Bunting. This will become a Cabletta Cardigan. My one other yarn purchase was a bit of an impulse buy. I happened to walk by the Fold's booth and it was not at all crowded, so I picked up this skein of Socks That Rock lightweight in Twitterpated (I felt the need for some superbright socks). The last thing on my list was a gradient braid of fiber from Fiber Optic, because last year the booth was too packed to get in. I scored this 80% merino/20% silk braid in Thunder & Lightning. My only other fiber purchase was not planned. When we went back on Sunday, we were able to get into the Spirit Trail Fiberworks booth. They're known for their luxury blend yarns, but what I discovered along the floor was a huge bag of natural CVM fiber. I'd loved spinning this breed in the Crown Mountain Farms fiber club last year, so I immediately bought 4 oz. of it in a dark brown. On the right is a Bosworth Mini with a Bloodwood whorl; it's 26 g/0.91 oz. and will be perfect for spinning laceweight spindles. On the left is a Spanish Peacock Russian in Bolivian rosewood that weighs 32 g -- my first support spindle! I even got a quick spinning lesson from the owner's wife (something that couldn't have happened if I'd tried to fight my way in on Saturday). I'm very excited about expanding my spinning repertoire and hope to at least get proficient in support spindling during the Tour de Fleece. So there you have it. I'm taking the day off from work to recover from a whirlwind weekend and do some knitting and spinning before I have to back to the craziness of my day job. I'm doing my best to remember how relaxed I was all weekend and trying not to think about what'll be waiting for me tomorrow morning! Back in the day when I was knitting nothing but socks, I was a very fast sock knitter. Now, though, it seems I've become a sweater knitter, so socks go slowly. 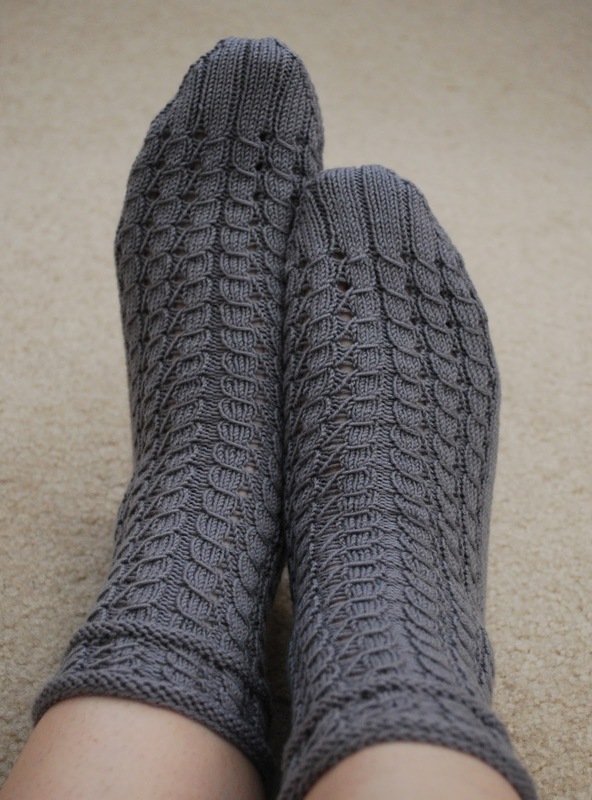 In any case, I have a finished pair that I'm very pleased with, in spite of the fact that they seemed to take an inordinately long time to knit. After having the book for a while and flipping through it from time to time to drool over the pictures, I finally decided it was time to knit something from it after the sudden loss of several pairs of socks. These socks seemed like the easiest to start with because they had the most manageable chart (my smaller projects are worked on during my lunch break at work, so I prefer not to have to deal with a large chart if I can). It took me a bit of time to make sense of the pattern, but once you realize how Hunter is explaining it, it makes perfect sense. The chart shows one pattern repeat of each direction -- if you look at the photo below, you can see that the pattern is mirrored so that the wraps go to the left on one half of the sock and to the right on the other. This means that you have to repeat a set of stitches in the chart a set number of times and then repeat the rest of the stitches a set number of times. It's sort of hard to explain, but it makes sense when you see the pattern. The stitch pattern is essentially a 4x1 rib with some elongated stitches that are passed over adjacent ones and some yarnovers thrown in for a bit of lace. It was rather fiddly to do at first, but once I got the hang of it and had the pattern memorized (by the time I got to the foot of the first sock), it went much faster. The ribbing is used on the heel flap. My only major modification was to adjust the toes because of my unusual row gauge. Normally with sock yarn I expect to get about 10 or 11 rounds per inch; with this yarn, I got 13. That meant that if I followed the pattern as written, I'd end up with socks and toes that were much too short. So I started the toe a little later (at 1.5" less than my desired length) and worked the decreases every other round until I had 18 stitches left. 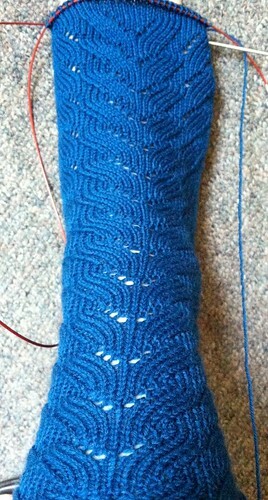 This resulted in a perfectly fitting toe, and I rather like the look of the ribbing on the top. As to the yarn, I really enjoyed working with it. I bought it years ago in a sale, probably at a store where I no longer shop, and it had been sitting in my stash ever since. It's actually a shame that it's discontinued, because it has great stitch definition. It's a cabled yarn, meaning it's composed of multiple strands that are already plied, so that means it also does that weird thing where one side of the stitch looks larger than the other in stockinette. I'm not too concerned about it being noticeable, however -- I mean, who's going to be looking at the bottom of my foot? Tomorrow morning, I am headed out bright and (relatively) early to head down to Maryland Sheep and Wool for the weekend. I'll be wearing my Ravelry pin, so if you're a reader and happen to see me, please say hello! Though I'll be back on Sunday afternoon, I'm taking Monday off from work to recover (and likely clean the house), so I'll be sure to post with a full recounting of the event and my acquisitions.